Matchbox Mack CH-600 Semi Truck Coca cola Premiere Collection Series 1. Truck is red with "Coke" on door. New in box. See the pictures for condition. 1998 Ford Expedition celebrating the 100th anniversary of the ford motor company. This item has been on display in the man cave for many years and has no original packaging but in perfect condition with no scratches or other markings. LAMBORGHINI MIURA P400 S. Una vez finalizado solicite su factura por todos los ítems. NEW IN ORIGINAL BLISTER. LOONEY TUNES. BUGS BUNNY. MATCHBOX 1993. 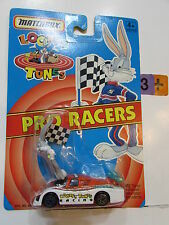 PRO RACERS. LAND ROVER DISCOVERY. LOOSE IN MINT CONDITION. DISPLAY SCENE NOT INCLUDED. MATCHBOX COCA COLA COKE VEHICLE. From the Enduring Characters Edition. We are always happy to work with you to help resolve any issues that may arise or slip our notice! 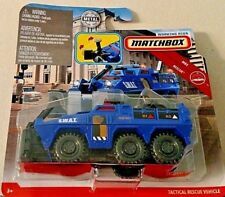 MATCHBOX 2019 WORKING RIGS S.W.A.T. 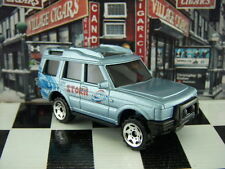 BLUE TACTICAL RESCUE VEHICLE NEW! HTF! WORKING RIGS. TACTICAL RESCUE VEHICLE. BLUE S.W.A.T. Condition is New. Dent in tHe front of the box. Matchbox Die Cast Great Beers of the World 1910 Renault AG Kronenbourg YGB07 See photo for condition. Please message with any questions.Shipping Policies We take great care packaging every item to ensure safe quality shipping. • USPS Shipping • Most shipments are sent out within 1 business day after payment is confirmed or cleared, unless stated otherwise in the listing. • Please make sure to provide the correct shipping address when placing your order, orders will be shipped out to the shipping address provided by eBay. • Packages are not shipped on Sunday. Transit time varies and depends on the carrier, we cannot be held responsible for delays caused by carriers. • Shipping time by eBay is estimated and not guaranteed and is subject to change especially during peak periods. Must have and is rare! Limited Edition. New and Never Played with. MATCHBOX - PREMIERE FIRST EDITION - SERIES 98. 1957 CHEVY BEL AIR CONVERTIBLE. LIMITED EDITION 1 OF 25,000. 1 COMPLETED MODEL - RED WITH RED AND WHITE INTERIOR. 1 PRODUCTION MODEL - RAW SILVER WITH WHITE INTERIOR. Matchbox Collectibles Texaco Collection 1939 Chevy Panel Van 1/64 MOC 2000 --- Fresh out the estate of an elderly collector. Very DETAILED MATCHBOX SUPERFAST Model. Matchbox Superfast Collectible. Matchbox Best Of Series 2. Range Rover Sport. New in the original package never opened. 2016 BEST of MATCHBOX '69 Cadillac Sedan DeVille Real Rubber Tires New in Package 1:64 Die Cast Always happy to combine shipping RETURNS: If there is ever a problem with anything you buy from me please know that I will do everything in my power to resolve the issue you have. I do accept returns PAYMENTS: I only accept payments through Paypal. I will only mail to confirmed Paypal addresses only. Shipping Policy: I WILL ONLY SHIP USING USPS MAIL SERVICES. I gladly combine shipping on multiple items. I do not offer pick up or delivery services. 2010 MATCHBOX LENSEY EDITION '57 CHEVY VHTF !! WE ALSO HAVE M2 MACHINES MODELS AND JADA CARS. Condition: NIB. Cards are clean! In the original box Matchbox Models of Yesteryear. This beer truck is from the Great Beers of the World Series. Condition: pre-owned - In great condition with minimal surface wear. 1997 MATCHBOX INAUGURAL COLLECTION BMW Z-3 Roadster, 2 car set. 1 of 20,000 limited edition. 1955 CADILLAC FLEETWOOD 1/64 MATCHBOX FACTORY SEALED! 2010 LESNEY EDITION MATTEL. Condition is New. Shipped with USPS First Class Package. please look at pictures closely. please ask any questions you have about the post. incase of multiple purchases please ask for shipping and handling quote. thanks for checking out the post. LISTED IS A BEST OF MATCHBOX LAMBORGHINI MIURA P400 S. BENT CORNERS ON BOTTOM. We have a large collection and will be adding more Hot Wheels And Matchbox almost daily. 2002 MATCHBOX Collectibles Coca-Cola 1999 Ford Mustang Convertible Limited Edition. Up for sale is a 1997 Matchbox Premiere Collection 8 Car Set With Display. This item is New In Box. The seal is broke on one side but never taken out of the box. HELLO MATCHBOX FAN'S,HERE I HAVE THE HIGHLY SOUGHT AFTER LIMITED RUN MATCHBOX COLLECTIBLES BARRETT-JACKSON 1956 PINK CADILLAC ELDORADO UP FOR GRABS. MBX HEROIC RESCUE. RAPIDS RESCUE. 103 OF 120. 2009 MATCHBOX LESNEY EDITION DIE-CAST. 1969 TYPE 14 KARMANN-GHIA CONVERTIBLE. CHECK THE PICTURES GOOD FOR THIS IS THE EXACT ITEM YOU WILL RECEIVE. IT IS MINT ON CARD, CARD IS IN VERY GOOD CONDITION. BLUE-PURPLE Aston Martin DBS Volante Matchbox 60th COMMEMORATIVE ~ SEALED Pack! Textured BLUE Paint also looks PURPLE in changed lighting. PIT - STOP ACTION PLAYLIST. MATCHBOX 1991. MATCHBOX RACING #11. condition card has soft corners. Reading, PA 19604. Kiddie Kar Kollectibles. '63 Mack B Model. Matchbox Superfast Collectible. Ultra Max Wheels. Very DETAILED MATCHBOX. We are always looking to buy Diecast Toys.